- Teddies Organic Rose Water Spray – I have posted about this spray before and I can’t stop raving about it to anyone who will listen. Just one or two sprays of this rose water and I feel refreshed. It’s perfect for traveling, especially on long flights and I take it with me whenever I fly. - Blush Bath bombs – Nothing beats a warm bath after a day of skiing. Thankfully the place we are staying at has a huge tub that I can’t wait to use since I don’t have one at home. I plan on soaking in a warm bath a few times and these bath bombs will be the perfect touch. - Philosophy Snow Angel Bath gel and Lotion– we haven’t had any snow in Chicago since December and I feel like the theme of these two bottles fit in more with the snowy mountains of Breckenridge. This trip I am checking a bag since my ski boots take up almost half my suitcase so I am not worried about the less than 4oz liquid rule. - Asos beanie – this is my favorite winter accessory I own right now. The one fluffy pom trend didn’t suffice so I found a beanie with two =o) I had previously ordered one from Aldo but they were sold out and after searching around I found this one on Asos website and love it. - Ski pants – yes I know, white ski pants. Am I crazy? How have these not gotten stained or ruined? I honestly don’t know but they are the most comfortable ski pants I’ve owned. - Asos beanie – I do wear a helmet when I ski (it’s pink!) but I wanted to add this beanie back in because I just adore the two pompoms. - Columbia socks – the warmest socks I own. I posted about them before my trip to Toronto and they have been a key wardrobe essential this winter. - Oakley goggles – I’ve had these for a few years now and have no complaints. They also match my white pants. - White long sleeve – this is one of the newer additions to my ski ensemble and yes it’s also white. Hopefully it will keep me warm. - Sweater – this sweater will be perfect for the evenings when we are sitting around the fire. Our Airbnb has a wood burning fireplace that will be the ideal place to relax every night after a day of skiing. Such a cute hat! I hope that you had fun skiing! I used to use rose water spray so much, I need to grab another bottle! 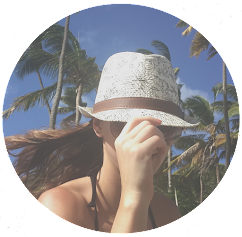 I nominated you for the one lovely blogger award! Perfect essentials for the ski! I love these photos and cute clothing picks! I love skiing although I'm not very good at it! The beanie is so cute! This is a cute post, definitely you're well prepared for your ski adventure. I'm wishing you the happiest on your birthday. Lovely picks, I adore the hat!! There are so many fun hats around right now and I love the one shown in this post, so cute! 100% on board with warm socks for winter sports too, or else it can be a pretty miserable experience haha. Have a lovely week! All great essentials for a ski trip. I love your beanie. I love the hat, I would love to go on a ski holiday but I'm afraid I'd be no good! These are the perfect winter accessories! Great essentials!!! I really would love to go to ski anytime soon!! The beanie is too cute. Went skiing last year and was terrible at it. Lol. Enjoy and stay warm! i've heard of people saying how good rose water is but i've never really tried a rose water spray or anything like that. i'm also picky when it comes to rose products since i have sensitive nose and can't take extremely scented things. also, that Lush's argan body conditioner looks scrumptious hahaha too bad i can't get any lush products here. These flat lays are flawless! 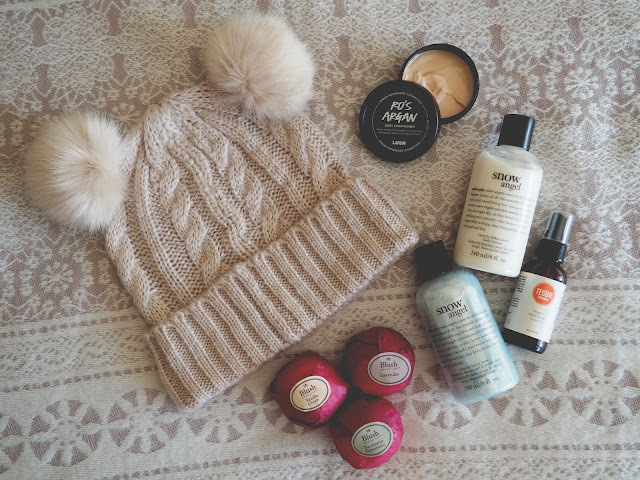 Really crushing on that double pom-pom beanie for winter.